The title "A Most Violent Year" is something of a misnomer. Yes, the film is set in 1981, New York City's most statistically violent until that time, but violence on screen is kept by writer/director J.C. Candor to a strict minimum. Rather it is about violence gathering like low-hanging clouds just off the side of every frame and gradually infecting the existence of Abel Morales (Oscar Isaac). He is a wonder of polite fastidiousness, a man who dresses not to kill but to impress, desperate to continually convey a cultured disposition, speaking with emphasis on the civilized nature of his voice. After all, he's merely a business man, or so he would have you believe. "You must take the path that is most right," he lectures, and you can tell he believes it. He really believes it. He runs an oil delivery business with his wife Anna (Jessica Chastain), and with their lawyer, Walsh (Albert Brooks), as consigliere. They are doing fine, making more than enough to purchase a suburban home as citadel, dressing with panache, asking for the wine list at dinner. But if "A Most Violent Year" revolves around that age-old marketing pitch of The American Dream, well, it's a commercialized ethos that goes hand-in-hand with avarice. Abel is not content to run a successful enterprise - no, he wants to be top dog, but being top dog means more problems. He takes out a massive loan on a piece of property along the East River intended to expand his fiefdom that must be paid back in thirty days. Bad dudes are hijacking his company trucks. The local D.A. is digging around in his past. 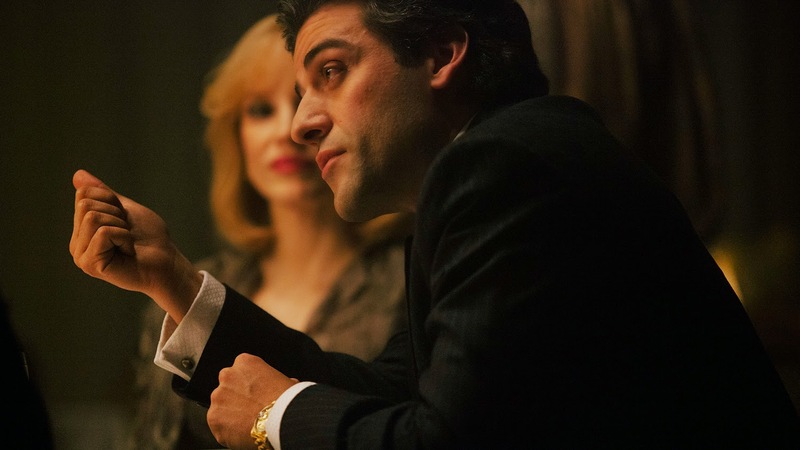 In so many ways there is nothing new about "A Most Violent Year." It's got the crime film playbook and runs it, step by step, right down to the hoary sequence where the law comes calling for Abel at his kid's birthday party. Hell, it’s even got a car chase. Yet that car chase, shown from Abel's point-of-view, feels different, like a refined man with a driver suddenly finding himself driving in a scene straight out of "The French Connection." It's like Abel has wound up in a yellowy seventies crime film, one of the ones he's probably seen and of which he's likely said, "It's just a movie. That has no basis in reality. Can't happen to me." But it has. And Chandor invests such low-pitched fervor into every detail, every foregone twist, every overcast frame, that the same old-same old still comes across stacked with slow-burning significance. The deer who helpfully blunders in front of Abel and Anna's so it can be put out of its misery is an absurdly convenient illustration of his distaste for violence and her lingering thirst for it, yes, but the manner in which she takes the gun her hubby didn't know she had and puts that mammal down is spine-tingling. In fact, there is more than a little of "The Master" dynamic here as we come to view Abel as the face of the franchise and Anna as its tough-minded brains, the gangster's daughter, the one cooking the books and smoking the cigarettes and talking tough. When their trucks are being stolen, he yearns to resist arming their drivers while she whole-heartedly endorses it. At times, you almost wish Chastain might hijack the movie in the manner of those vehicles, but the story Chandor wants to tell is of a man who has come to believe so heartily in his own high-class persona that he seems virtually incapable of acknowledging the mud in which he's stepped. "This is what it's come to?" he asks his lawyer upon being told they should confer outdoors. "We have to walk around outside like we're mobsters?" Abel doesn't get it but Walsh does. It's that kind of film, one where the lawyer isn't so much the main character's conscious as the pragmatic truth-teller. In his previous films, the solid "Margin Call" and the superb "All Is Lost", Chandor told exceptionally tight stories of cataclysmic events impressing themselves upon their male protagonists. "A Most Violent Year" follows an identical blueprint but its plentiful atmosphere elicits less urgency than melancholy, like an elegy appropriate to a funeral home. This is about a man straining for upward mobilization only to find himself in a downward spiral, regressing to the mean of every criminal enterprise where shots are fired and people die and you learn that rules aren’t made to be broken, per se, but must be broken simply to stay ahead and stay alive. "The result is never a question for me. Just the path that you take to get there. You must take the path that is most right." And by the end, whether he knows it or not, Abel has come to learn that sometimes, to maintain a kingdom, the path that is most right, is actually most wrong. On finishing it, I felt the violence of the title wasn't so much as a misnomer as it was a steering away from the more traditional use of violence to mean physical, instead being violent in that incredibly foreboding, emotional way that tends to take over everything in its reach. By the end of the film, Abel still hasn't been physically violent but he's definitely undergone influence from a destructive emotional force. So, that, even the film's generally familiarity in content it doesn't matter because between Isaac's excellent work (with Chastain and an undersung Elyes Gabel backing him), Gordon Willis' photography, and Chandor's diretion everything is working together in an expert fashion.